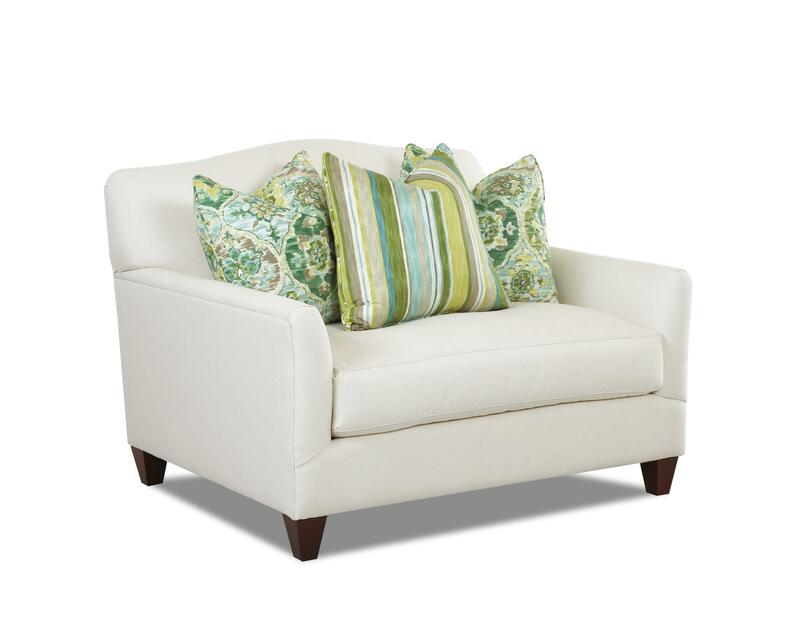 What is not to like about the regal elegance of this large chair that is matched only by majestic comfort? Slender track arms with a simple, inner curved shape flow right into the tight camel back that provides the romantic shape of the chair. Comfort is not lost with this chair. The bold, bench seat and the three included back pillows are a down blend cushion, providing very natural and relaxing comfort to anyone who sits on this sofa. The Leighton Contemporary Chair with Bench Seat Cushion and Camel Back by Klaussner at Value City Furniture in the New Jersey, NJ, Staten Island, Hoboken area. Product availability may vary. Contact us for the most current availability on this product. The Leighton collection encompasses a noble spirit that will add fine character to your living room. 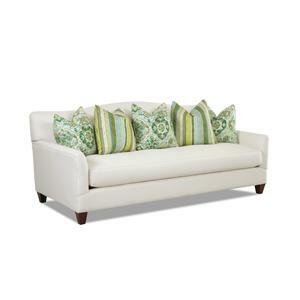 What this contemporary collection does best is provide modern style and quality comfort with dignity and class. Tapered wood legs, track arms and a tight, camel back all provide a stylish element, but in a supple manner. The track arms incorporate a slight inner curved shape that establishes a soft elegance. The camel back is draped with back cushions for extra comfort and style. 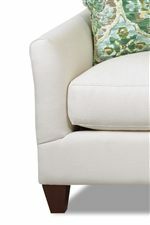 The cushion padding of this collection is a down blend, providing royal comfort. Many fabric combinations are available for both the pillows and collection pieces that can be mixed and matched to create the collection that is right for your home. The Leighton collection is a great option if you are looking for Contemporary furniture in the New Jersey, NJ, Staten Island, Hoboken area.